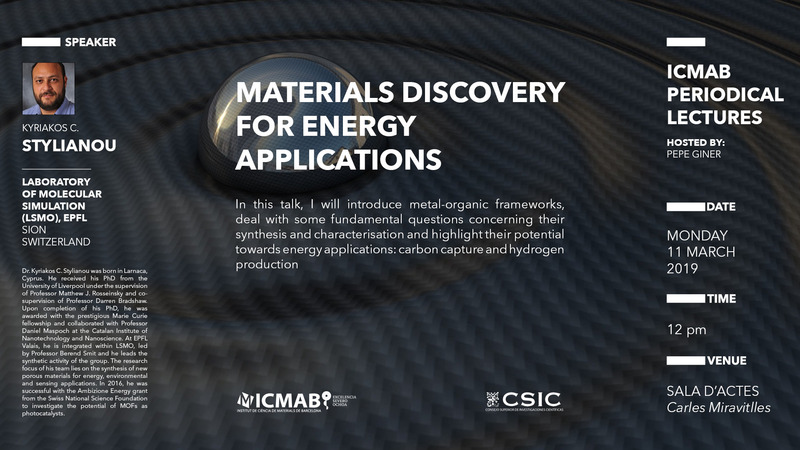 In this talk, I will introduce metal-organic frameworks, deal with some fundamental questions concerning their synthesis and characterisation and highlight their potential towards energy applications: carbon capture and hydrogen production. Dr. Kyriakos C. Stylianou was born in Larnaca, Cyprus. He received his PhD from the University of Liverpool under the supervision of Professor Matthew J. Rosseinsky and co-supervision of Professor Darren Bradshaw. Upon completion of his PhD, he was awarded with the prestigious Marie Curie fellowship and collaborated with Professor Daniel Maspoch at the Catalan Institute of Nanotechnology and Nanoscience. At EPFL Valais, he is integrated within LSMO, led by Professor Berend Smit and he leads the synthetic activity of the group. The research focus of his team lies on the synthesis of new porous materials for energy, environmental and sensing applications. In 2016, he was successful with the Ambizione Energy grant from the Swiss National Science Foundation to investigate the potential of MOFs as photocatalysts.